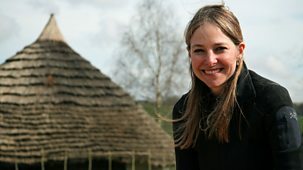 Professor Alice Roberts joins the team excavating a 3,000-year-old Bronze Age village in the Cambridgeshire Fens that has been called the British Pompeii.\n \nThe village earned its nickname because 3,000 years ago it burned to the ground, and as it burned it fell into the peat, preserving both the houses and their contents. Until its discovery, we had little real idea of what life was like in Bronze Age Britain. \n \nNow we can peek inside our Bronze Age ancestors' homes as archaeologists discover perfectly preserved roundhouses, and the contents inside them - right down to the utensils in their kitchens. These roundhouses were built in a style never seen in the UK before - testimony not only to the villagers' technical skills, but also of their connections to Europe. \n \nThe team has made other incredible discoveries on the dig - from Britain's oldest-found wheel, to swords used in battle, and bowls still containing preserved remnants of food. One of the biggest revelations is the discovery of a complete set of the early technology used to produce cloth - a full industrial process we've never seen in Britain before. \n \nThis glimpse into domestic life 3,000 years ago is unprecedented, but it also transforms our impressions of Bronze Age Britain - far from being poor and isolated, it seems the villagers were successful large-scale farmers who used their farming surplus to trade with Europe, exchanging their crops for beautiful glass jewellery and multiple metal tools per household. \n \nAs part of the dig, the archaeologists also investigate the cause of the fire - was it just a terrible accident, or did the villagers' wealth provoke an attack?